Well, of course it’s spring. Spring brings that uncertainty—you never know what the weather is going to be like from one moment to the next—at least here in the Pacific Northwest. Just two weeks ago, it was sunny and warm when I got home from work I was inspired to start the spring cleaning in my yard. I even planted some tulip and daffodil bulbs that I bought right before the ground froze. Filled two big bags with dead foliage to take to the recycling center and discovered the first spring blooms. 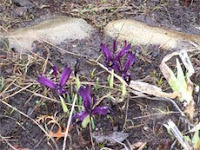 Today those blooms are covered in snow—only an inch or so melted down from the original three to four inches that arrived overnight, accompanied by a winds coming from a variety of directions. A friend of mine said the snow at her place looked like white dunes, blown on the Palouse desert”! More wind and snow expected today, keeping many of us from heading north to the spin-in in Coeur d’Alene. But the snow gave me the background for taking a picture of my finally finished cabled socks. My pal Miss “T” (for Terror) had to check to see what I was doing. Miss “T” was rescued and given to me when I was recovering from ankle surgery (I have an artificial ankle, not knit!). I think my brother believed that a cute little kitten to pet would help me keep my mouth shut. She’s what’s called “blue and cream,” so the vet called me, and she was named Miss Terror because she would chase my brother’s feet and attack his large dogs. She has become a companion cat—she’s beside me when I sleep, knit, sew, garden (attacking my weeding hands) and at the computer (nudging my hand on the mouse to remind me she needs petting). I enjoy knitting socks, though I hardly ever knit any for myself. My feet are hard on socks and I don’t usually don’t want to take a chance on beautiful knitted socks for myself. But this pair, I’m keeping. They feel pretty solid—made from a blend of KnitPicks nylon/wool—they should wear well. I was lucky to find a knitter on Ravelry who had some of the same yarn in her stash. Although I had two skeins, I found out that wasn’t enough to finish this pattern (from an Interweave book). The socks sat for a week or two while I was deciding what to do with not enough yarn, and in the meantime, I took the entrelac class (see my March 12 blog). I have a finished pair of socks from a beautiful (Sundara) dyed Cobalt over Mediterranean superwash Merino in the hedgerow pattern. I was led to both the yarn and pattern through Knitting Daily. The web provides such inspiration for us knitters! Anyway, I can’t decide whether to sell, give, donate or wear these beautiful blue socks. Maybe I’ll wait to decide after I’ve worn these cabled socks for a while. Maybe I’m “walking” softer these days! Time will tell. And time will turn spring into summer! Long Weekend Ahead for Knitting, etc. I'm taking two days vacation and looking forward to a long weekend. Shame it's going to be cold and rainy! I'll have to stay inside and knit! Last week I finished my first two entrelac projects--headscarves that tie at the back of the head--the pattern, Quant, is free on Knitty.com. And, it's not as difficult as it looks--but it makes use of self patterning yarn, so there's no changing colors or weaving in, etc. The yarn was Taos--100% wool--and frankly, I will never choose to use it again (except to finish something with the ball that's still in my stash!!). It splits; it tears; it's horribly difficult to frog. But then, I'm used to alpaca!! Now it's time to start a bigger project--the project I've had in mind since I first bought Donna Kooler's Encyclopedia of Knitting--the Kaleidoscope wrap! Don't tell anyone, but I placed the order for yarn online today--I really needed this yarn--for Pete's sake! Can't wait to try the Noro Silk Garden. It's also self-patterning--a blend of kid mohair and lambs wool. It earns a high rating on Ravelry. But I'm promising myself--no starting the wrap until I finish the sweater I started knitting for myself before the Christmas Thanksgiving holiday--too many things to knit for other folks and for bazaars, etc. The sweater is a lucious blue alpaca, and it is really so close to done--back, one front, sleeves, a second front almost done. But my office is cold all year round, so even if I don't get it finished before spring comes, it won't matter. My third entrelac project will be the Annelac socks--bought that pattern yesterday with no specific yarn in mind (except for the lucious alpaca that my brother has for sale . . . . maybe I can sneak into his stash for these!) Maybe I should finish, ummmm--let's see: sweater for daughter; socks for me; socks for friend; baby hats for the birthing center; felted bag--half knit; vest for granddaughter; quilt for brother; wall hanging for me; baby quilt for church; felted bag--barely started . . . . ). And I'm looking forward to my first venture into dyeing . . . So little time. . . so much to do!! !